Hands on: Motorola Moto X review | What Hi-Fi? Motorola has confirmed that its Moto X smartphone will be released in the UK, France and Germany in Februrary. Bringing with it voice activation functionality and other intuitive features, Motorola hopes that its latest device can cause some disruption within the Android camp. We got the chance to get hands on with the device, review the new features and get a first impression. The first thing that struck us about the device is the minimalist styling. Our initial impression is that Motorola has taken design cues from the two previous Google Nexus devices. When you pick it up, the Moto X fits comfortably in the hand – seeming small compared to many of the flagship devices on the market, which will be a good or bad thing depending on personal preference. Regardless, the Moto X is still a well designed handset, and little touches like a soft matte back make all the difference. It may be made of plastic, but it feels sturdy and can comfortably sit among other Android handsets at this price level, such as the Google Nexus 5, when it comes to design. On the top you'll find a 3.5mm headphone jack, a USB charging port on the bottom, and power and volume rocker keys on the right. The Moto X will arrive in the UK sporting black and white finishes. Phones 4 U will have exclusive rights to the white version for the first three months after launch. One thing that set the Moto X apart from other smartphones in the US was the ability to customise the phone in hundreds of different ways, thank to the 'Moto Maker' feature. Sadly, this aspect of the handset isn't present on the the UK model for now. Motorola has fitted the Moto X with its own X8 Mobile Computing System. This includes a software optimised 1.7GHz dual-core Qualcomm Snapdragon S4 Pro processor and quad-core Adreno 320 graphics. This may not be industry leading anymore, but in our initial use of the phone, we didn't suffer any lag whatsoever. There's 2 GB of RAM too, and a 2200mAh battery which Motorola claims can last a full 24 hours. We were shown a demonstration model which had been used all day, with GPS, wi-fi and mobile data all turned on. It had been off charge for close to 10 hours and still had 30% battery remaining. Initial impressions are good, then. The 4.7-inch RGB AMOLED display has a somewhat underwhelming 720p HD screen and 316 ppi. While it may not be full 1080p HD, colours looked vibrant, text was clear and brightness levels were good, when viewed in isolation. One nice feature that sets the Moto X apart is Active Display. This feature shows you basic information, without the hassle of having to unlock the phone. You can see previews of any notifications, and with a touch and drag on the screen, you can view that notification in more detail, without having to go into the relevant app. 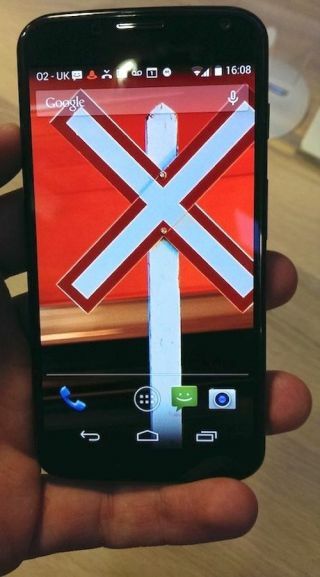 Motorola has fitted a 10-megapixel camera to the Moto X. This can take full 16:9 photos and record video in full 1080p HD. Clear Pixel technology aims to take better low-light shots and reduce motion blur in bright light. The few photos we took yielded good results. But its the way in which the camera can be accessed that impressed us. A simple twist of the wrist will fire it up in seconds. And in order to prevent pictures of the inside of your trouser pockets, this feature relies on a light sensor to let it know when it's being used. A front facing 2MP camera is also onboard, and this can also record full 1080p HD video. One of the main features of the Moto X is the use of touchless controls. The device has an always-on feature that will respond to the user saying "OK Google Now." It learns the voice of the user, so only they can operate it. In a demonstration, this worked well. The phone was quick to respond to the user's voice, and Google Now provided search results in seconds. If you misplace your phone, then providing you are within a certain distance, you can ask your phone to sound an alarm so you can find it. Even in an area where there was a lot of background noise, the Moto X was able to pick up the user's voice and respond. We look forward to testing this out more thoroughly. Motorola had just one accessory on show at the launch event, but one that could prove incredibly useful. It's a mobile battery charger which can not only charge the Moto X with the dedicated cable, but it can also charge another external device via USB at the same time. The unit itself is charged via USB, and a battery indicator on the front lets you know how much juice you have left. So, our initial impressions of the Motorola Moto X are pretty good. We like the design, the build and the intuitive features. All that remains now is for us to give it a full review in the not-too-distant future.